The aim of this information sheet is to help answer some of the questions you may have about having selective laser trabeculoplasty. It explains the benefits, risks and alternatives of the procedure as well as what you can expect when you come to the hospital. If you do have any questions or concerns, please speak to a doctor or nurse caring for you. What is a selective laser trabeculoplasty? A selective laser trabeculoplasty is a procedure used to treat or prevent high eye pressure (also known as intraocular pressure). 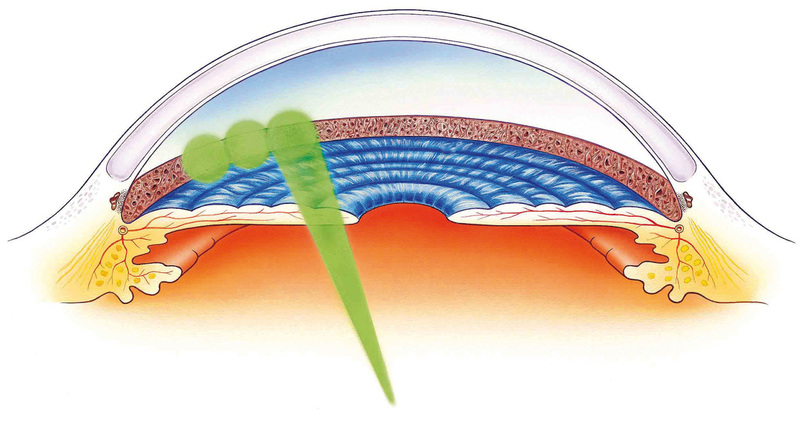 If you have healthy eyes, the fluid in your eye (aqueous humour) flows through your pupil into the front of your eye. It then drains away through drainage channels called the trabecular meshwork. However, if you have open angle glaucoma or ocular hypertension, the drainage channels may be visible but do not work properly. Because of this, aqueous humour cannot leave your eye, so your eye pressure increases. This pressure injures your optic nerve that carries information from your eye to your brain, and damages your vision. In a trabeculoplasty procedure, a laser beam is applied directly to the drainage channels, which helps to reduce the resistance to the flow of fluid. This means the aqueous humour flows through the channels better, which reduces the pressure in your eye. Aqueous humour is a completely different fluid to your tears, which will not be affected by the operation. The Mechanism of Action of SLT – interview with Mr K. Sheng Lim. What happens during a selective laser trabeculoplasty? The treatment takes 1-2 hours in total. You will first see a nurse to have drops in the eye and then we carry out the treatment in one of our laser treatment rooms. You will then have some more drops put into your eye. These are usually a drop to lower the eye pressure and an anaesthetic eye drop to numb the eye. You will then sit at a machine similar to the machine used to examine your eyes at the eye clinic. However, there is a special laser attached to this machine. The doctor will put a special contact lens on your eye before applying the laser beam. This lens allows the doctor to view your iris clearly so he or she can apply the laser and open up the drainage channels. The treatment is painless due to the anaesthetic drops used to numb your eye before the laser. The treatment itself takes approximately 20 minutes. After the procedure, you will return to the waiting area. The doctor or nurse will usually recheck the eye pressure before you are discharged. You don’t need to do any special preparations such as fasting or changing into operating theatre clothes. It is important that you use your regular eye medication drops as normal on the morning of your laser treatment – unless your doctor has told you otherwise. What are the benefits of having a selective laser trabeculoplasty? If the treatment is successful, most patients no longer need to use eye drops to manage their glaucoma or they will be able to reduce the number of drops used. This is not a permanent treatment and may need to be repeated within months to years in order to continue management without eye drops. Are there any risks associated with selective laser trabeculoplasty? Complications after this treatment are uncommon. Occasionally your eye pressure will rise immediately after laser treatment. If this happens, you may need extra treatment before you can go home. Very occasionally, there may be inflammation in the eye after the laser that will require treatment with drops for a few weeks. This treatment usually comes in the form of eye drops, but it comes in the form of tablets too. Your doctor will let you know which treatment you need and advise you of how long you need to take the treatment for. If we do treat you with eye drops, a doctor or nurse will put them in your eye before you leave hospital. You will be asked to remain in the department until your eye pressure has reduced to a satisfactory level. This should take a few hours at most. We won’t know whether the laser treatment has been successful for about six weeks. Sometimes one procedure is not enough and we may need to repeat the laser treatment. Occasionally, the laser treatment does not reduce the pressure within the eye to a satisfactory level. If this is the case, you will have to continue with eye drops, or you may need a different treatment. If you experience any of these symptoms, please contact the Kersley Clinic for advice immediately (see front). Alternatively visit your nearest A&E department out of hours. The alternative to this laser treatment is to start or continue with eye drops to lower the pressure in your eye or surgery. What do I need to do to prepare for selective laser trabeculoplasty? As this is an outpatient treatment, you can eat and drink as normal. You must take your eye medication as normal on the morning of the laser treatment. You will be seen a few weeks after the laser treatment to make sure your eye has responded well to laser treatment. You will have another check-up to see if the treatment was successful. You should be given a follow-up appointment before you leave after the treatment. If you have discomfort once you get home, we suggest that you take your usual pain relief following the instructions on the packet. You may also find that your vision is a little blurred. This is normal, and your vision should return to how it was before the laser within two hours. If any of these symptoms last longer than two hours, or if you are worried about your eyes, call the Kersley Clinic for advice (see front). You can also visit your nearest A&E department. We may prescribe anti-inflammatory drops after your laser treatment. These help to minimise inflammation (not infection) within the eye. People normally only have to take these for a week at most – the doctor will tell you how long you need to take them for. You don’t need antibiotics because your eye doesn’t have an open wound. If you are using glaucoma drops, please check with the nurse or doctor whether or not you need to continue using them on your treated eye. It is usual to continue using them unless your doctor has said otherwise. If you are using glaucoma drops to the untreated eye, please continue to use them unless clearly instructed otherwise.